Imagine the ability to view anything that ever appeared on almost any computer.The computer forensics show is the "don't miss" event of the year for all Llitigation, Accounting and IT Professionals. (PRWEB) August 31, 2009 -- Imagine the ability to view anything that ever appeared on almost any computer. Computer forensics pertains to the legal evidence found on computers and digital storage media (it was a computer forensics expert who discovered that Bernie Madoff never made a trade). Increasingly, computers are being used as evidence in a wide spectrum of cases, from the millions of instances of identity and credit theft to employee and intra-company disputes. Computer forensics has become vitally important to IT security professionals, lawyers and accountants, and even the average consumer surfing the Internet -- in short, to anyone who depends on the safe and efficient storage and retrieval of data. Statewide Compliance Training of Oregon announces its release of their Quarterly Responsible Vendor Training DVD for liquor licensees in Oregon. The DVD touches on important alcohol laws such as ID Checking, sales to Minors, selling alcohol to a Visibly Intoxicated Patron and allowing VIPs to consume. This 30 minute video training is approved by the OLCC. (PRWEB) August 31, 2009 -- In Oregon, if you sell alcohol and have a liquor license through the Oregon Liquor Control Commission (OLCC) you could receive a several hundred to several thousand dollar fine for selling alcohol to a minor. And, if you sell too many times in two years your license to sell alcohol can be revoked. The Oregon Liquor Control Commission has an incentive program for licensees to keep them on track and reduce the chances of accidental sales to minors due to poor training. The "Responsible Vendor Program" which is a self certifying program that when a licensee is in compliance with its requirements and they mistakenly sell, or their employee sells alcohol to a minor; their fines are reduced significantly AND they can NEVER be revoked. One of the required elements of being in compliance is to give your employees Quarterly Training. To make this task easier,more informative and consistent; Statewide Compliance Training of Oregon (SCT) which is operated by FORMER OLCC INSPECTORS, created a 30 minute training video. Once you purchase the Responsible Vendor Training DVD you can show it as many times as you like. So the $200.00 price tag is much more bearable. "Show it to your employees every quarter and document that you did and what day they watched it, that will keep you in compliance with that requirement" Says Alan Espasandin, CFO of Statewide Compliance Training. "The DVD isn't just for licensees that are in the program, any licensee and their employees can benefit from this training...it is a nice "refresher" of the basic rules and laws that they must follow every day; and by taking this training it may help reduce their fines in other areas should they have violations." The DVD has some lighter and humorous moments but touches on the very serious laws about selling alcohol to minors, checking ID, selling to visibly intoxicated patrons (VIPs) or allowing a VIP to consume alcohol. SCT also included a short video, more on the very serious side, called "Last Call." A testimony oriented video produced by the Oregon Liquor Control Commission (OLCC) and the Oregon Department of Transportation (ODOT). If you just want to see the video "Last Call" you can view that on their website www.sctuniversity.com and there is a short teaser video from their RVP Training to give you an idea of what their video is like. The DVD can be purchased on their website http://www.sctuniversity.com by using PayPal or a credit card. The shipping is free. Statewide Compliance Training has plans for more training DVD's in the future. Their compliance training does not stop at the alcohol industry; they also provide training and certifications in the maritime security industry. The company is located in Vancouver Washington at 6300 NE St. James Rd Suite 104-A, Vancouver, WA 98663. Their phone number is 1-866-SCT-OLCC. Or if you want to contact them by email admin (at) sctoforegon (dot) com. The California personal injury attorneys of BISNAR | CHASE (www.BestAttorney.com) have filed a products liability wrongful death lawsuit against Ford Motor Corporation, Bridgestone Tire Corporation, and TRW Vehicle Safety Systems. The suit alleges that the 1991 Ford Ranger SUV manufactured by Ford failed to properly protect Milton Perry Jr. during an April 2009 rollover crash that caused his ejection and death. Riverside, CA (PRWEB) August 31, 2009 --The California personal injury attorneys of BISNAR | CHASE (www.BestAttorney.com) have filed a products liability wrongful death lawsuit against Ford Motor Corporation, Bridgestone Tire Corporation and TRW Vehicle Safety Systems. The suit alleges that the 1991 Ford Ranger SUV manufactured by Ford failed to properly protect Milton Perry Jr. during an April 2009 rollover crash that caused his ejection and death. The action was brought against the defendants by plaintiffs Pamela Perry and Gwendolyn Scott, Milton Perry's sole surviving adult children. Bridgestone did recall some tires but failed to recall the tire models found on Mr. Perry's SUV, which had similar design and manufacturing defects that Bridgestone knew could cause premature, sudden and catastrophic tread separations. In the legal action against the defendants, plaintiffs allege that Perry Jr. was driving his Ford Ranger at a legal speed on Interstate 10 in Riverside County. When one of the SUV's Bridgestone tires separated and blew out, Perry lost control of the SUV and it rolled over several times before coming to rest and bursting into flames. Although Perry was ejected during the rollover, the injuries he sustained were fatal, resulting in the wrongful death claim. "We're alleging that Bridgestone knew these tires were unsafe," said Brian Chase of the BISNAR | CHASE auto defects law firm. "Bridgestone did recall some tires but failed to recall the tire models found on Mr. Perry's SUV, which had similar design and manufacturing defects that Bridgestone knew could cause premature, sudden and catastrophic tread separations." The plaintiffs allege that the 1991 Ford Ranger lacked sufficient lateral and roll stability to keep the SUV upright during cornering and handling by an ordinary driver during foreseeable road and traffic conditions. The plaintiffs further contend that the Ford Ranger's restraint system manufactured by TRW Vehicle Safety Systems was also unsafe. This includes the seat buckles, seat belts, shoulder belts and retractors. Allegations that the restraint system's geometry was unsafe, and that it lacked pre-tensioners were also leveled against TRW. The Plaintiffs contend that the defendants knew these parts and systems would fail to restrain an occupant in the event of a rollover accident. In addition, the plaintiffs also allege that when the Ford Ranger rolled over, its A and B pillars, windshield headers and roof rails lacked the strength and structural integrity to withstand the SUV's roof crush forces during foreseeable rollovers. "This flies in the face of advertisements that extol the virtues of the 1991 Ranger being 'Ford Tough,'" said Brian Chase. contain Mr. Perry during the rollover," noted Brian Chase. "It's our position that Ford knew that laminated glass supported by a substantial metal framework could have prevented the total shattering of the side window during this rollover, and that Mr. Perry's death could have been prevented had this readily available technology been used in this SUV." The plaintiffs believe that since 1970, the defendants knew that the use of tempered side and rear window glass was contributing to serious occupant ejection problems in side impact and rollover accidents. Published reports by Ford engineers and tests conducted by the National Highway Traffic Safety Organization confirmed the efficacy of these improvements, with NHTSA citing an 86 percent reduction in rollover fatalities for drivers of vehicles with improved side window glazing. This wrongful death products liability case is pending in the Superior Court of California, County of Riverside, case number BLCOO4822. BISNAR | CHASE Auto Defect Attorneys represent people throughout the country who have been very seriously injured or lost a family member due to motor vehicle defects. The law firm has won a variety of challenging auto defect cases against General Motors, Ford Motor Co., Chrysler and many of the foreign manufacturers. For more information, read "Still Unsafe At Any Speed: Auto Defects That Cause Wrongful Deaths and Catastrophic Injuries" by Brian Chase and see http://www.AutoProductLiabilityLawyers.com. Orlando law firm launches newly redesigned site in order to serve visitors more effectively. SeifertMiller, LLC, an Orlando-based law firm specializing in personal injury, recently launched their newly designed website as a part of their overall marketing plan to offer clients, as well as potential clients, more comprehensive information about the firm's services. Orlando, FL (PRWEB) August 31, 2009 -- SeifertMiller, LLC, an Orlando-based law firm specializing in personal injury, recently launched their newly designed website as a part of their overall marketing plan to offer clients, as well as potential clients, more comprehensive information about the firm's services. The newly launched site, www.seifertmiller.com, has been designed to easily assist those looking for a personal injury attorney. Orlando, home to many attorneys of different specialties, offers consumers a variety of options for finding the legal counsel and representation they seek. SeifertMiller's website, points out partner, Jeffrey Miller, is meant to separate the firm from its competition by offering a convenient, feature-rich experience and a host of information. We offer information, we offer honest representation, and we offer support through what is often a difficult time. Our website is often the first impression that clients may have of our firm and we wanted it to reflect our experience, our attention to detail, and our desire to provide our clients with all the information they need to make informed decisions. Our new site better positions our firm as a legal resource in the Orlando community," says Miller. "Our expertise is not confined to one genre of personal injury law; we have extensive experience to offer our clients in a variety of specialties and our website reflects that." Through its online resource, SeifertMiller offers visitors the ability to learn more about the firm and its attorneys, and to specifically learn more about the many areas of specialty for which the firm offers representation - including motor vehicle accidents, product and premises liability, and violent crimes. Additionally, the site offers a resource section with answers to common questions and web links to relevant legal sites. Those visitors interested in receiving a free consultation with the firm or simply learning more about their rights with regard to their injuries can submit their information quickly and privately online after which a SeifertMiller attorney will follow up on the request. "At SeifertMiller we have built a reputation based on our care and concern for our clients," says Miller. "We offer information, we offer honest representation, and we offer support through what is often a difficult time. Our website is often the first impression that clients may have of our firm and we wanted it to reflect our experience, our attention to detail, and our desire to provide our clients with all the information they need to make informed decisions." SeifertMiller, LLC, based in Orlando, Florida, specializes in personal injury claims on behalf of injured victims. We service over 4000 long-term care centers across North America and it's critical that our technology is secure and uncompromised. Our clients need to know that their clinical and financial software is always available to them and Escrow Associates is an important partner in helping us achieve this. Atlanta, GA (PRWEB) August 31, 2009 -- Escrow Associates, a top 3 provider of software escrow services worldwide, announces today the release of their SaaS software escrow agreement. A recent report from Forrester shows that SaaS backup and security policies are one of the three major concerns of companies interested in SaaS, which Gartner predicts will comprise 9% of total software sales by 2012. Escrow Associates designed their SaaS contract to address the fears of the growing market, protecting data and software at a secured location, and making it available when needed. "We service over 4000 long-term care centers across North America and it's critical that our technology is secure and uncompromised." says Heath Odom, VP of Business Development at PointClickCare, a leading provider of SaaS-based solutions for the long-term care industry. "Our clients need to know that their clinical and financial software is always available to them and Escrow Associates is an important partner in helping us achieve this." Access to data is the primary difference between SaaS and traditional source code escrow solutions. Historically, an end user had possession of their data and could find another application if their software vendor failed. With SaaS, the data is often hosted offsite, and is inaccessible if the vendor fails. Escrow Associates' SaaS technology escrow agreement, however, provides for the data to be deposited and updated, so that the application and data are always available for release. This allows businesses to resume their vital operations quickly. Some agents make the process even simpler by ensuring the integrity and currency of the source code with software escrow verification services. In a SaaS environment, these testing services can also recreate the hosting environment and provide access for end user testing. These services protect both providers and subscribers, because they know that the escrow account contains useable code. As the third largest provider of software escrow services worldwide, Escrow Associates provides superior services that protect the interests of both the depositor and the beneficiary. Their services bring value and peace of mind to hundreds of clients throughout the United States. Businesses trust them to develop customized escrow solutions for the future viability of their organizations. To learn more visit www.escrowassociates.com. The Prinz Law Office will be hosting a webinar titled "What Companies Need to Know about the Legal Risks of Business Blogging" on Wednesday, September 9, 2009 from 10:00 a.m. to 11:00 a.m. PST. The program will examine the current legal landscape for business blogging and provide best practices for companies to follow in minimizing their risks. Los Gatos, California (PRWEB) August 30, 2009 -- The Prinz Law Office is pleased to announce that it will be hosting a webinar titled "What Companies Need to Know about the Legal Risks of Business Blogging" on Wednesday, September 9, 2009 from 10:00 a.m. to 11:00 a.m. PST. The program will examine the current legal landscape for business blogging and provide best practices for companies to follow in minimizing their risks. The speaker, Prinz Law Office Managing Principal Kristie Prinz, is a frequent author and speaker on blog law issues, and she recently completed work on a monograph titled, "Managing the Risks of Employee Blogging," which is scheduled to be published by the Science and Technology Law Section of the American Bar Association. Ms. Prinz is an avid blogger herself of two legal blogs: the California Biotech Law Blog and the Silicon Valley IP Licensing Law Blog. Ms. Prinz said, "Businesses often set up blogs for advertising and promotion purposes without really considering any of the legal risks that business blogging could pose for the company. This program is intended to educate businesses and the attorneys who represent them on the risks of business blogging, and what can be done to manage those risks." The Prinz Law Office is a Silicon Valley-based law firm, which specializes in providing intellectual property counsel to clients in the high technology, life science, and e-commerce industries. The firm is nationally recognized for its intellectual property licensing and e-commerce expertise, and is regularly featured in the media on intellectual property, e-commerce, and entrepreneurship issues. To learn more about The Prinz Law Office, please call (800) 884-2124 (toll free) or visit www.prinzlawoffice.com. To register for the program, visit http://businessblogging.eventbrite.com/. Simmons Firm Employee Foundation 5th Annual Golf Tournament To Benefit H.I.S. K.I.D.S. This Virtual Legal Administrator wants to help you establish, maintain and grow your business by utilizing her intellectual capital. Her effective and efficient business support and management skills are sure to enable you to grow and prosper your business. As your virtual assistant, you will get the support you need. Chicago, IL (PRWEB) August 30, 2009 -- The Bureau of Labor Statistics reported that 2,700 jobs were lost in the legal industry in July as reported by JDJournal.com at http://www.jdjournal.com/2009/08/10/bls-legal-industry-lost-2700-jobs-in-july/. Legal industry layoffs have included both lawyers and staff. Carmela Williams, a student at the University of Denver Sturm College of Law pursuing the MS in Legal Administration, launches Virtual Legal Corner - http://www.virtuallegalcorner.com. The busines provides legal administration and management support services to the legal community (attorneys considering startup firms; established law firms; legal departments; court systems and others). As law firms went through a frenzy of lay-offs last year and this year, lawyers and staff found themselves unemployed. Carmela Williams joined the ranks of the unemployed in February, 2009 after being laid off from a law firm in Washington, DC. She has been doing all the right things in her job search, but to no avail. Six months later, she is still unemployed like so many others. Carmela contemplated her future and what it held. Realizing she possessed a wealth of intellectual capital (IC), she thought about how best she could utilize that IC in a down economy with a focus on the legal community. Equipped with an entrepreneur spirit and her IC, she started her own business - Virtual Legal Corner, http://www.virtuallegalcorner.com. Her goal is to provide an environment that could potentially serve as a one-stop shop for services conducive to supporting the legal community. As your virtual assistant, she would provide numerous support services ranging from administration to document production to human resources management to marketing to research and writing. This would allow her to maximize her time with her clients and enable her clients to concentrate on business development, the practice of law, other business-related matters and eliminate ongoing staff expenses. These services would: provide the essential support an attorney starting his/her own practice needs; benefit established legal entities; provide skills that a company's current personnel may not have; or provide additional resources to a company. For additional information, visit the website at http://www.virtuallegalcorner.com. Sign up to receive the company's free newsletter - http://www.virtuallegalcorner.com/contact.htm. Carmela Williams is the founder and owner of Virtual Legal Corner. She has over twenty years of combined experience in legal and business administration, document production, IT, marketing and user support. Virtual Legal Corner is a professional home-based business. PowerScore releases The LSAT Logic Games Bible Workbook, a companion to the bestselling LSAT Logic Games Bible, providing readers with additional practice on the techniques for mastering the analytical reasoning section of the Law School Admission Test. (PRWEB) August 29, 2009 -- PowerScore releases The LSAT Logic Games Bible Workbook, a companion to the bestselling LSAT Logic Games Bible, providing readers with additional practice on techniques for mastering the analytical reasoning section of the Law School Admission Test. PowerScore is set to release the highly anticipated LSAT Logic Games Bible Workbook, to be used in conjunction with the acclaimed LSAT Logic Games Bible. This latest publication, written by PowerScore founder and LSAT expert Dave Killoran, joins a formidable lineup of best-selling publications focused on teaching students how to obtain a competitive score on the LSAT. The 255 page book contains actual logic games and multiple drills created to reinforce the skills needed to effectively attack the Logic Games section. Each answer key presents an ideal setup for the game, with every rule and important logical inference discussed and diagrammed, and all of the questions answered and explained. In addition to the drills, The Workbook contains 30 separate LSAT games, drawn from the LSATs administered between December 2002 and December 2006 without any repetition from the games and drills covered in the Logic Games Bible. The analytical reasoning section, commonly referred to as Logic Games, is considered to be the most difficult for students taking the LSAT for the first time. The section contains four games or puzzles, followed by a series of five to eight questions designed to test the ability to make inferences which exist within the setup. The ability to perform well is based on the ability to understand the types of games which frequently appear and to properly diagram the rules and make the correct inferences. Combined with the LSAT Logic Games Bible, the two PowerScore publications provide a complete methodology for attacking the analytical section of the LSAT. "The LSAT Logic Games Bible teaches a system to attack Logic Games whereas the Workbook allows students to practice applying that system to real LSAT games. This practice and the corresponding explanations will help students become faster, more confident test takers, which will ultimately lead to higher LSAT scores," said Dave Killoran. The LSAT Bibles are available through PowerScore's website at www.powerscore.com and select retailers nationally. PowerScore is one of the nation's fastest growing test preparation companies. Headquartered in Charleston, South Carolina, PowerScore offers LSAT, SAT, GMAT, and GRE preparation classes in over 125 locations in the U.S., Canada, and Puerto Rico, and live online classes worldwide. Security Company certified for upholding rigorous standards for safety, service, installation and inspection. Freeport, NY (PRWEB) August 29, 2009 -- New York Merchants Protective Co., Inc. is pleased to announce that its facilities and services are now ETL listed by Intertek - a Nationally Recognized Testing Laboratory (NRTL) recognized by the Occupational Safety and Health Administration (OSHA). The ETL listing indicates that NYMPC, its Central Station, and associated services have meet or exceed rigorous operational and safety standards. The certification designates NYMPC's conformance to a wide range of compliance measures and also indicates that the company is subject to ongoing inspections to maintain its certification. "New York Merchants Protective Co. has long been committed to upholding the highest standards in the security industry for safety and service," said Mark Fischer, Executive Vice President and Chief Technology Officer of NYMPC. "Receiving the ETL Certificate of Compliance is yet another indication to our customers that our alarm systems and services have been thoroughly reviewed, and proven to meet or exceed industry standards". "I believe because of ETL's responsiveness to the industry we will be able to bring to market newer and better equipment, and services, sooner than with other programs". With offices around the world, Intertek Group is a global leader in testing consumer goods and services. Its proprietary ETL Listed Mark stems from the original Electrical Testing Labs, founded by Thomas Edison over 100 years ago. New York Merchants Protective Co., Inc. installs, services and monitors security and fire systems for over 75,000 locations nationwide and has been doing so since 1910. Protecting over $100 BILLION in property and assets, Approved by ETL and Underwriters Laboratories (UL) and holding the coveted listing for National Industrial Monitoring and Certified as a "Five Diamond Central Station" by the Central Station Alarm Association, NYMPC is ranked as the 32nd largest security company in the United States by SDM Magazine (May 2009). Comprehensive services include 24/7 customized monitoring, closed-circuit TV systems, remote video and environmental control monitoring, wireless medical alarms and industrial process monitoring, among many others. NYMPC's fire alarm system capabilities include a wide range of services including advanced fire detection, manual pull stations, sprinkler water flow and tamper devices, as well as voice evacuation systems. For more information on NYMPC or any of its services, call 1-888-NYMP-911 or visit nympc.com. On August 27, 2009, Guaranty Financial Group Inc. ("GFG") and its wholly owned subsidiaries, Guaranty Group Ventures Inc., Guaranty Holdings Inc. I, and Guaranty Group Capital Inc. (collectively with GFG, the "Debtors") filed voluntary petitions under Chapter 11 of the Bankruptcy Code in the United States Bankruptcy Court for the Northern District of Texas, Dallas Division (the "Bankruptcy Court"). Dallas (Vocus/PRWEB ) August 28, 2009 -- On August 27, 2009, Guaranty Financial Group Inc. ("GFG") and its wholly owned subsidiaries, Guaranty Group Ventures Inc., Guaranty Holdings Inc. I, and Guaranty Group Capital Inc. (collectively with GFG, the "Debtors") filed voluntary petitions under Chapter 11 of the Bankruptcy Code in the United States Bankruptcy Court for the Northern District of Texas, Dallas Division (the "Bankruptcy Court"). These cases are styled and numbered In re Guaranty Financial Group Inc., Case No. 09-35582-bjh, Guaranty Group Ventures Inc., Case No. 09-35583-hdh, Guaranty Holdings Inc. I, Case No. 09-35584-bjh, and Guaranty Group Capital Inc., Case No. 09-35586-hdh. The cases have been assigned to Judge Barbara J. Houser, Chief Judge of the Bankruptcy Court. A motion for joint administration of these cases is pending before the Bankruptcy Court. In addition, the Board of Directors of each of the Debtors has determined to reduce the size of the respective Boards and the number of officers serving each of the Debtors. That decision follows the appointment of the Federal Deposit Insurance Corporation ("FDIC") as receiver for Guaranty Bank. The Board of Directors of each of the Debtors has determined to consolidate all of its officer positions and has appointed Dennis S. Faulkner of Lain Faulkner, & Co., an accounting firm specializing in bankruptcy matters, as Chief Restructuring Officer ("CRO") of each of the Debtors. Mr. Faulkner has also been elected to serve as the sole director of each of the Debtors effective August 27, 2009. Previously designated officers and members of the Board of Directors of the Debtors will no longer serve in their previous roles effective August 27, 2009. The Debtors' bankruptcy proceedings are not expected to have any impact on the banking operations previously conducted by Guaranty Bank. Those operations were transferred by the FDIC to BBVA Compass as the FDIC announced on August 21, 2009. WorldRegistryOfWills.com is an informative website that helps people to register the location of their will, ensuring a copy is always available in case the unthinkable should occur. Recently, website founder Bruce Letendre sat down to talk about why registering a will's location is so important, as well as the goal of his new blog. Peachland, BC (PRWEB) August 28, 2009 -- Drafting wills can be a bit of an unpleasant subject. Not only does one have to consider the consequences of choosing beneficiaries, but worst of all, think about mortality. Because such thoughts are so difficult to sort out, it's quite possible that important details could slip through the cracks. Bruce Letendre is the proprietor of www.WorldRegistryOfWills.com, a seven month old database website that urges people to prepare a will with a lawyer, and register the location of the will to ensure it can be found when needed. It's most important for couples with families, but even those who aren't married or don't have children should draft a will. This fact is declared year after year by numerous legal fraternities. "Getting your will drafted and its location registered should be a top priority," said Letendre. "It's most important for couples with families, but even those who aren't married or don't have children should draft a will." Letendre's website allows these important documents to be added to a will database that is accessible in many countries around the world. "Failure to make a clear and legal disposition of money, possessions and property, or failure to draft to draft a will at all is one of mankind's common faults," said Letendre. "This fact is declared year after year by numerous legal fraternities." Some of Letendre's own tips will translate over to his newly launched blog at www.WorldRegistryOfWillsBlog.com. Letendre plans for the blog to contain several bits of information regarding the importance of registering a will, as well as some of the other details to consider once one has decided to draft a will with their lawyer. With the advancement of computer and web-based technologies, preserving information and sensitive materials has become much easier. However, it's still important to register the location of a will, as this is the best way for one to ensure their wishes are carried out upon passing. When a will is poorly drafted or the location isn't disclosed, often family and friends are forced to use hearsay to determine the deceased's final wishes. World Registry of Wills is owned and operated by Bruce Letendre. A mother complains, yet, a window remains unfixed until an 8 year old plunges 7 stories. New York, NY (PRWEB) August 28, 2009 -- An 8-year old, appropriately named Destiny, falls out of a 7 story broken window at her housing project apartment and miraculously escapes death. In an interview with the New York Post, Destiny's mother said she first informed the city Housing Authority of the faulty windows in August 2008. The window was scheduled to have been repaired last month, but it wasn't. While no case has been filed, New York personal injury lawyer David Perecman predicts a successful bodily injury lawsuit against the Authority. The girl suffered a broken leg, broken hip and damage to her liver and intestines. "It's a mother's worst nightmare. Knowing that you tried to protect your children and the city failed you," said Perecman, who is not representing the family. Chances are New York personal injury lawyers won't fail this family now. Destiny's mother had long complained to the Authority that the upper portion of the window opened more than the maximum allowed 4½ inches. "Unfortunately, to protect children, it takes an incident like this. Every parent in New York, personal injury lawyers included, knows how important those windows are," added Perecman. For the past 25 years, the New York personal injury lawyers, construction accident, auto accident and medical malpractice lawyers at The Perecman Firm, PLLC have championed all types of cases for personal injury accidents. David Perecman, founder of the Firm, is the past Secretary of the New York State Trial Lawyers Association (NYSTLA) and a chair of its Labor Law Committee. 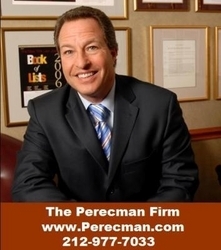 Mr. Perecman's achievements have brought him recognition as an Honoree in the National Law Journal's Hall of Fame, in New York Magazine's "The Best Lawyers in America" and The New York Times Magazine "New York Super Lawyers, Metro Edition". Houston, TX (Vocus/PRWEB ) August 28, 2009 -- Lex Mundi has published a new multi-jurisdictional real estate survey, Issues Relating to Commercial Leasing. Prepared by the Lex Mundi Real Estate Practice Group, the survey is the fourth in Lex Mundi's four-part real estate survey series. With the release of the Issues Relating to Commercial Leasing survey, the Lex Mundi Real Estate Practice Group has successfully completed the real estate survey series. These four surveys, in which more than ninety jurisdictions are covered, will serve as a valuable practice resource not only for Lex Mundi member firm lawyers, but for in-house counsel and other professionals as well. The Issues Relating to Commercial Leasing survey provides an overview of the important issues involved in the leasing of commercial real estate projects. Topics discussed include the liability for transfer taxes payable on creation or assignment of a lease, the formal requirements for the execution of a lease, and any restrictions on the transfer of ownership of real properties subject to a lease. The Real Estate survey is available to download free of charge in its entirety or by jurisdiction at http://www.lexmundi.com/lexmundi/Real_Estate_Survey_Part_IV.asp. Robert Krapf, a director with Richards, Layton & Finger, P.A., Lex Mundi's member firm for Delaware, and the chair emeritus of the Lex Mundi Real Estate Practice Group, commented, "With the release of the Issues Relating to Commercial Leasing survey, the Lex Mundi Real Estate Practice Group has successfully completed the real estate survey series. These four surveys, in which more than ninety jurisdictions are covered, will serve as a valuable practice resource not only for Lex Mundi member firm lawyers, but for in-house counsel and other professionals as well." The first three parts of the real estate survey series - Issues Relating to Foreign Investment, Issues in Ownership of Real Property, and Issues Relating to Finance - are also available to download free of charge on the Lex Mundi web site. All Lex Mundi multi-jurisdictional surveys and other publications are available to view at http://www.lexmundi.com/lexmundi/Publications_and_Resources.asp. Lex Mundi is the world's leading association of independent law firms. The association has more than 160 member firms around the world, representing approximately 21,000 lawyers. Membership in Lex Mundi provides member firms with a trusted network of law firms that share similar values and a similar focus on quality through which they can access global legal resources that enable them to serve their clients better and to improve continuously all aspects of their firms. Member law firms are located throughout North America, Europe, Latin America and the Caribbean, Asia and the Pacific, the Middle East and Africa. Through its nonprofit affiliate, the Lex Mundi Pro Bono Foundation (www.lexmundiprobono.org), Lex Mundi member firms provide pro bono legal assistance to social entrepreneurs around the globe. For more information about Lex Mundi, please visit www.lexmundi.com. For a printable version of this press release, please visit http://www.lexmundi.com/images/lexmundi/PDF/PressReleases/PracticeGroup_RESurveyIV.pdf.